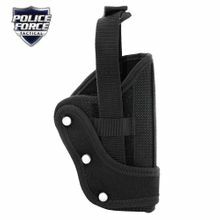 The Police Force 9mm Gun Holster is as tough as you are! This durable yet light weight and water resistant holster is made of reinforced 1800 denier polyester. It is a great choice for those who want a high quality 9mm automatic holster without breaking their budget. The holster features a double velcro belt loop and adjustable. Ideal for Law Enforcement, Security, Military Personnel, and Gun Enthusiasts. This universal holster is for OWB carry on a duty belt.